No interest if paid in full within 6 months on purchases of $500 - $999.99. No interest if paid in full within 12 months on purchases of $1,000 or more. Interest will be charged to your account from the purchase date if the purchase balance is not paid in full within the 6 or 12 month promotional period or if you make a late payment. Pullsdirect.com is a part of the build.com network of online stores. 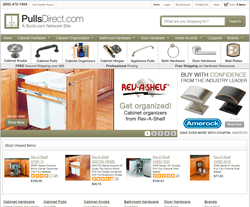 Pulls Direct store sells cabinet hardware and other matching door hardware. When places require restoration or a change in design, stores like pulls direct help people scrape a large collection of cabinet and door related hardware to resolve their problems. The online store has a large collection of cabinet knobs, cabinet pulls and cabinet hardware to suit the needs of almost all types of customers. All the products on pulls direct online store are from the top manufacturers in the industry. Companies like Amerock, Liberty hardware, top knobs supply products to the website for selling. The accumulation and sale of products from the finest manufacturers in the industry ensures customers about the fine quality of the products. Products made up with different materials ranging from brass and chrome, to bronze and pewter are available on their web store. Apart from these variations, people can choose products based upon style. Different designs of products on the store include contemporary, traditional, crystal and glass, rustic hardware, kids themed products and many other types of styles. The site has almost all sorts of cabinet decor accessories available on its store. Pulls direct claims of having the lowest prices for products in its industry as it procures the products directly from the manufacturers and ships them directly to its buyers. The elimination of middlemen from between strengthens the claims of the company. The company offers free replacements to its customers for products which get damaged while shipping. Not to mention, the company follows all the norms of a good online retail organisation. The clean and simple design of the website allows the users to search and choose the products of their choice. A quick shopping cart is also present on the website so people can make quick purchases of the items they like. Pullsdirect.com being a subsidiary of Build.com has some great backup in terms of technology and service. Build.com operates a network of websites which sell products in the home improvement niche. The company also has discount offers to avail upon its website throughout the year. Pullsdirect.com also offers free shipping on its top knobs. Being into business for the past 16 years, build.com has established a great reputation in the market, and pullsdirect.com carries the same legacy with it. The business has a responsive sales and enquiry team in place to answer all business related queries of the customers. The times for contacting the company are clearly mentioned upon their website. Being into business for this long, the site has built some serious reputation in the market. The site has some of the most extensive and varied collection of cabinet organizers, cabinet pulls, cabinet hinges, appliance pulls, bath hardware and door slides in the market. With easy shipping and payment options, buying from pulldirect.com is always easy. Sometimes you can change the look of an entire room simply by making one minor alteration to the way it looks. If your kitchen could use a mini-makeover, it¡'s possible that you can do wonders just by changing the pulls on your drawers and cabinets. If you¡'d like to see what options are available to you, a good place to start is by visiting Pulls Direct. Pulls Direct specializes in pulls of all kinds, for any room in your home. You¡'ll find drop pulls, bar pulls and many other types of pulls in several shapes, sizes and styles. Pulls Direct also carries a variety of cabinet hardware for any room of the home, so you can find everything you¡'re looking for on their site. If you¡'re interested in cabinet organization tools, you¡'ll find those at Pulls Direct too. You¡'ll find some of the top brands in the industry, along with some great accents for your home too.